Continuing with the translated stories of Prof. Narke from 'Sai Sarovar', here is yet another story wherein Prof. Narke again gets proof of Sai Baba's pervasiveness and omnisence. In the year 1913, Shirdi was again dawn with plague epidemic. Witnessing the results of the epidemic, fear of death settled in Prof. Narke's mind. He was thinking that if he stayed in Shirdi he will have to face death. Many a times the cause of person's unstable state of mind is his own thoughts and fears. In this epidemic, a sweet vendor had to sacrifice his life. Sai Baba called Narke and entrusted him a job. He gave Narke some money and said, "Go and bring sweet for prasad from Rangrao's shop". There were not many shops of sweets in Shirdi and Narke was totally aware where the shop of sweet was since he was living in Shirdi from considerable time. It was evening time. When Narke reached the shop he saw that the shutter of the shop was half closed. Exactly near the cupboard where the sweets were kept, a man was covered with a white cloth and was lying on the floor. A lamp was lighted near his head and Rangrao's wife Sitabai was crying hidding her face in a corner. Narke, saw all this and was confirmed that the man who seems to be sleeping was not a human, but it was a dead body. Narke was in a fix now. On one hand a dead body is lying in the shop and the death was due to plague and on other hand Baba had strictly told to get the sweet from Rangrao's shop. How can a sweet from such shop be consumed? But was not Baba fully aware that Rangrao had met his fate before sending me here? There may be some deep reason behind Baba's sending me to this shop. Narke asked for sweet from Rangrao's wife. She pointed to the cupboard and said, "You yourself take sweet from the cupboard and weigh it. Narke did so and kept money aside and left. Narke placed the sweet in Holy Feet of Baba. Baba distributed the sweet among the devotees present in Dwarkamai. 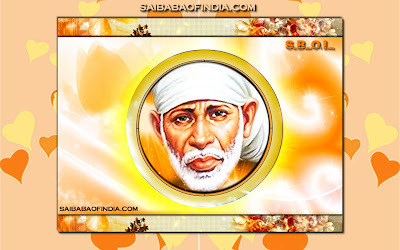 Baba said to Narke, "Do you think that by living in Shirdi you will die and if you leave Shirdi will you be saved? This is your delusion. This Dwarkamai will save the one whose death has not come and the one whose death is definite, will die". Thus the fear of Narke was destroyed by Baba in a practical way. In the next post we shall see how Narke's wish to take Sanyaas was not accepted by Baba as He was aware of Narke's bright career and future.